You are currently browsing the tag archive for the ‘Don Ticchio’ tag. 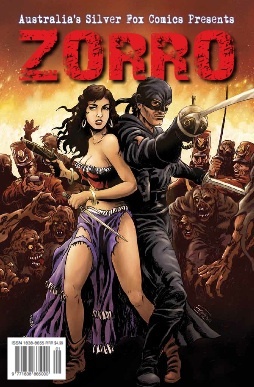 I need to preface this review by saying Zorro is not my fandom. I love a good swash and buckle, but my experience with Zorro is limited to the Antonio Banderas films of 1998/2005. However, I was very interested to see what an Australian writer would bring to this story, so accepted review copies from the publisher. This new comic series jumps in with two feet. It seems the assumption is the reader will have familiarity with the story of Zorro, and will not need anything about his motivation or his past explained. In one way this was a good thing, as it meant the action began on page one, but it also meant I was a bit bewildered for much of the story as to who the characters were, and why things were happening. That said, over the course of three stories (issue one is a double feature), there was a gradual reveal of character backgrounds and relationships, which worked quite well.